Our personal care Mouthwash products include the world famous listerine as well as Scope. Mouthwashes kill the stinky germs in your mouth giving you fresh breath all day. Preventive maintenance on your teeth and gums is essential to good health. Johnson and Johnson Listerine Antiseptic Mouthwash Cool Mint - 3.2 Oz. Johnson and Johnson Listerine Antiseptic Mouthwash - 3.2 Oz. Listerine Original Antiseptic Mouthwash - 1.5 Ltr. Listerine Original Antiseptic Mouthwash - 1 Ltr. Listerine Cool Mint Antiseptic Mouthwash - 1.5 Ltr. Listerine Ultra Clean Artic Mint - 1 Ltr. Listerine Ultra Clean Artic Mint - 50.7 Fl. Oz. 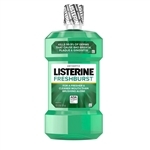 Freshburst Listerine Mouthwash - 1.5 Ltr. Listerine Ultra Clean Cool Mint Mouth Wash - 50.7 fl.oz. Total Mouthwash Peppermint - 16.9 Fl. Oz. Total Mouthwash Peppermint - 33.8 Fl. Oz. Total Mouthwash Spearmint - 16.9 Fl. Oz. Total Mouthwash Spearmint - 33.8 Fl. Oz. Listerine Ultraclean Cool Mint - 1 Ltr. Total Mouthwash Peppermint - 8.4 Fl. Oz. Optic White Mouthwash - 16 Oz. Optic White Mouthwash - 32 Oz. Optic White Mouthwash - 8 Oz. Listerine Total Care Zero Mouth Wash - 500 Ml. Listerine Zero Clean Mint Mouth Wash - 500 Ml. Colgate Peroxyl Mouthwash Rinse - 8 Oz. Colgate Total Gum Health Mouthwash - 500 Ml. Colgate Peroxyl Mouthwash Rinse - 16 Oz. Colgate Phos-Flur Mouthwash Original - 16 Fl. Oz. Wholesale mouthwashes from listerine and scope for commercial healthcare facilities. Inflammation in your gums and mouth has been linked to many other diseases, so keep your mouth clean.